What the F Happened?DC5 Archives - What the F Happened? This is a blog story of Eagles Rescued. DC4 is an Eagle Rescued from having its leg being trapped in twigs. DC5 is an Eagle Rescued from being bullied that came into its own and became a leader. Thank you for following my blogs. My Pet Eagles made it to the What The ‘F’ Happened blog list in the category of WTFH To Relationships because these two Mated Bald Eagles could be used as the symbol for how a monogamous relationship between a man and a woman should be. The Mated Bald Eagle was chosen to be the American Bird – the Emblem and Magnificent Symbol Patriotism of the United States. It was chosen for its since of love and duty, its strength, its intelligence, and its predatory manner of protectionism. Click Here To learn about the third mating season these two have had and learn how much they have grown themselves. These two were about 5 years old when they got married (met and mated). The year after they mated they were married for life. We do not know what nest Mr. P or The First Lady came from when they hatched. We do not know where they were when they met each other and fell in love. But what we do know is that in 2014 this couple purchased a nice piece of real estate in North East Washington, DC inside the beautiful Arboretum. The view these two have from this nest had to be seen by them while they were dating (‘Perched‘ together in trees). It took this couple a year to build their nest in its current location. The nest is huge and as you will soon see, the nest is large and sturdy enough to hold a 170+ pound human. I also believe that this pair has encountered humans somewhere during their lives. Since my last Blog about My Pet Eagles welcoming their two eaglets much has happened. DC4 hatched March 29th making it 27 days old and DC5 hatched Marched 30th making it 26 days old as of the posting of this Blog (April 24, 2017). From the time they hatch to the time they leave the nest (Fledge) is about 12 weeks. These two will Fledge this nest sometime around mid-July. Hundreds of pictures have been taken and many videos of this Bald Eagle’s Family. For the purpose of showing you how fast DC4 and DC5 have grown, I’ve selected a few pictures to display in this blog. Leading up the event that caused for the eagles rescued, you need a guide or a story-line to follow. If not, then all you’ll have is a bunch of disconnected videos and Facebook comments. That is why I created this Blog. Please know that this is my narration of the life of this eagle family. Others might disagree with me. I do my best to stay in line with the terminology, the copyright mandates, activities, and chronology of events and activities. As I have documented in previous blogs, my purpose in blogging is to provide a story-line about the life of this Eagle Couple who in 2014 was named Mr. President (Mr. P) and The First Lady (TFL) and help generate traffic to the DC EAGLE CAM so that you would become as interested as I am about these birds so that you will learn and share what you learned about these birds with those you know who would become as passionate as thousands have become since the AEF set up the DC EAGLE CAM. Note: I am not a specialist. I am not paid by any group. I am not a member of any special group or support group. No one authorized me to write blogs or provide any form of education. I do my utmost to not contradict what any authorized official documents about these birds and the many web sites about them. My opinion is just that; an opinion. Since DC4 and DC5 hatched. Both parents shared the responsibility of providing enough food to feed themselves and keep their two hungry and fast growing eaglets well fed. DC4 was born first and in my opinion, being first hatched makes you closer to your parents. They love you just a little more because they gave you all of the attention. That is what happened to DC4. Because it was first hatched, it received the love and attention of both parents. Therefore, by the time DC5 was born, although not more than a day older, DC4 was smart enough to bonk or poke at DC5 to keep it away from the food and parents. I noticed that DC4 received the most food for either parent. Only when both parents jointly feed both eaglets or only when DC4 had had it fill of food would DC5 be able to eat a decent amount of food. When DC4 bonked or poked DC5, DC5 would lower its head or turn its back and stay away from the feeding until it could reach the food or be fed by one of the parents. In my opinion, DC5 was passive. It would not aggressively go after food during feeding. When it was its turn to eat, DC5 would not open eagerly its mouth wide enough to be fed by the feeding parent. 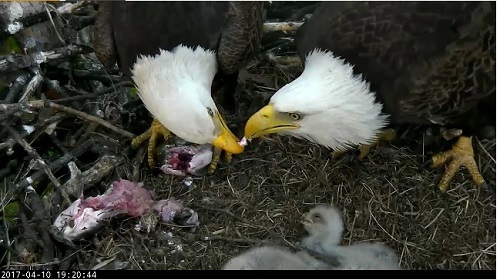 Here’s a picture of Mommy Eagle force feeding DC5 who is laying down during a feeding. 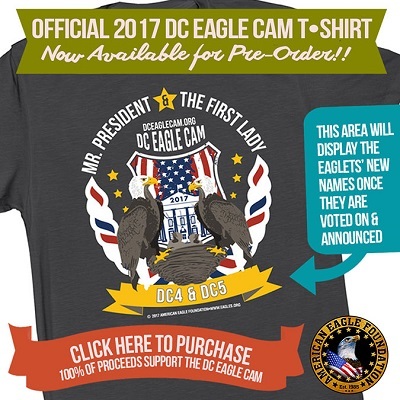 You can go to YouTube and search DC Eagles or DC Eagle CAM and watch countless AEF Approved videos and you will see for yourself, DC4 was passive and never received an equal share of the food during feeding time. At one point, I really was worried that DC4 would not receive enough nutrients to survive when if the weather turned cold or too hot. Because eagles get their fluids from the food they eat, fresh fish is their food of chose because fish are full of fluids. I worried that DC4 would poke out the eye of DC5. I noticed that when the Daddy was in the nest DC4 would not bully DC5; however, when mommy eagle was in the nest and when she would turn her back, DC4 would wear out DC5’s head or neck. That is why DC4 is seen laying around a lot. That is to keep DC4 from bullying him. 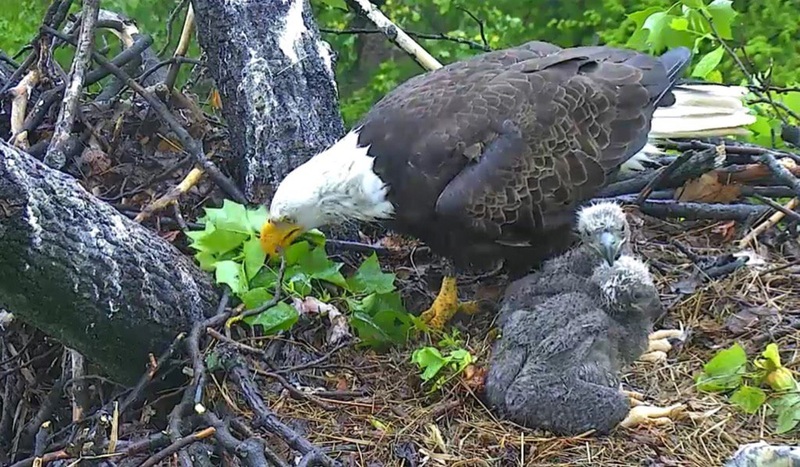 Watch this video recorded by YouTube’s “birdbrain56”, on April 6th, Mommy and Daddy Eagles spend quality time together in a drenching Spring Rainy day. You can study the video closely to get to know the difference between Mommy and Daddy Eagle. I have been able to tell the parents apart by the following features: Daddy Eagle is smaller. His beak is yellow-gold. Daddy’s head is bigger than Mommy’s. The skin around his talons are beige in color. His white neckline is ragged and under his neck the white feathers appear to taper off as if they were a collar and inside his breast is a thin line of white feathers looking like a tie. His eyes are sharp and furious looking. Mommy Eagle is a bit taller and wider than Daddy Eagle. Mommy Eagle eyes are sunken and long-gated with a greyed sleek shadow. Her white neckline is tapered and neat. Her beak is orange with a layered-lump from the bridge of her beak to her nostrils. Mommy Eagle has two black spots in the back of her head. The skin around her talons are rough and deep yellow; she could really use a pedicure. These two eagles really love each other and they love their baby eagles (eaglets)! As of the posting of this Blog, the difference between DC4 and DC5 is simple. The soft white fuzz on DC4’s little face comes all the way down to the bridge of its beak and all the way around its face. DC4 is a tad-bit taller. The soft white fuzz on DC5’s little face is further back on its head and further back around the side of its face on both sides. Behavioral differences between DC4 and DC5. Before the rescue of DC4 on April 20th, DC4 was more adventurous than DC5. DC4 would walk to the edges all around the nest. DC4 would lay its head around the outer perimeter of the nest. DC4 would walk around the flapping its wings and often times intimidating DC5. Whenever a parent arrived with food, DC4 would be the first up and wobbling over to the feeding parent and would eat until it had to raise its little behind and poop (skeeting thick white waste). DC5 did not stray far away from the center of the nest. DC5 laid around and slept a lot. DC5 would cling under its parents; it tends to hold onto Daddy Eagle more. Whenever it rained both eaglets would tuck their heads under the sitting parent. Whenever both parents were in the nest at the same time, both DC4 and DC5 would humble themselves by bowing their heads in submission and wait for feeding instructions. I noticed that DC2 and DC3 did the same thing last year. This tells me it’s a natural behavior for this breed. After a good feeding, the eaglets will go to sleep. When they were a few days old, the parents would tuck the babies under its breast and sit on top of them over a nest bowl. Once the eaglets became too large to tuck into a nest bowl, the eaglets would tuck their heads under the wings and in-between the legs of the parents and the parent would pull nest hay over the bodies of the eaglets to keep them warm or protected. At three weeks, the eaglets have started to display unique personality traits, which makes it easy to name. Err goes the naming period. Also, the eaglets are showing what they are learning. They look out for their parents. They have a unique audibles. They watch their parents fly in and out of the nest. They buck each other for food. Both parents rotated shifts for feeding and nest keeping duties. They communicate with each other making different audible noises that I dare not try to describe. If you pay as close attention to this family as I do, you will know what the auditables are and mean based on what is going on inside the nest. 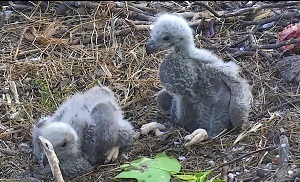 Okay, the eaglets are now three weeks old. We’ve learned a lot about them. They are cute, smart, feisty, and are growing like crazy. This brings me to April 20th, the night that the eagle rescue of DC4 took place. 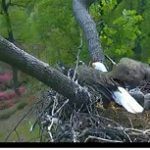 Sometime around 4:30pm on April 20, 2017, My Pet Mommy Eagle was performing her normal feeding of her two baby eaglets (DC4 and DC5) when DC4 the older of the two siblings got its fill of food and wondered off as it normally does to the two Large Tree Branches that come together to form a “V” on the outside of the nest. The V-Shaped area the two old branches this tree makes have become an area of poop for the two eaglets. You can tell by the smears of white poop all over the two branches in the V-Shaped area. On this occasion, DC4 went over to do its business and stepped into a group of loose twigs that the parents laid for keeping their babies from falling out of the nest. Mommy Eagle had started feeding DC5 and finishing up the fish when DC4 tried to return to the nest bowl and could not because its right foot became stuck in the loose twigs. It could not free itself. Mom and DC5 continued eating. Mom even tried to give DC4 more food. It was clear to those monitoring the CAM at the AEF that DC4 was in distress and a eagle rescue had to be ordered. This feeding was around 5pm. There is normally another feeding before bedtime around 8:30pm. Mommy Eagle stopped feeding DC5 and tried to free DC4’s leg from the twigs to no avail. Mommy Eagle calls out to Daddy Eagle. DC4 is jerking its stuck leg so much that it looks as if it could break its leg if it is not freed. Also, DC4 is whaling and crying so much that it is disturbing to look at and hear. It is clear to all watching that if DC4 was left like this overnight night, by morning, it could become dehydrated and eventually succumb to the pain of trying to jerk its leg free. Then there was another problem, there was a looming severe thunderstorm. The clouds and winds were starting to roll in over the nest. It was not looking good for DC4. Having hundreds of people watching real time as DC4 tries to free itself and listen to the yelps it makes as it cries out and watch Mommy Eagle try to help her baby and hear her audible for help is disturbing. I am certain that the good people at AEF realized that having a few hundred people watching this event real time would result in the situation going viral, they had to make a call for an eagles rescue of DC4. That Human’s name is Matt Morrison. Craig Koppie of the USFWS, Marty Levine and Matt Morrison of Ex-cel Tree Experts were the night-time rescuers. Each of the following videos show a different angle or version of the eagles that rescue Matt Morrison makes of DC4. On April 20th, around 4:30pm, DC4 ventures into the outer perimeter to poop and is unable to return to the feeding. This video picks up around 6:30pm about two hours after DC4 gets leg caught in loose branches. Mommy Eagle is busy finishing the feeding. Click Here to watch YouTube’s “Lolaboo two2” records this activity. Click Here to watch YouTube’s “Lil Sunrise” video that picks up around 8:45pm showing DC4 extremely exhausted. You can tell that decision had been made to rescue DC4 because you can hear the humans underneath the tree getting closer to the nest. Watch the Mother Eagle be concern about DC4. She is trying to free her baby but she cannot. She is distracted by the noise the rescuers are making under her nest. At About 9:50pm, they make so much noise she gets scared and flies up into a branch directly over her nest. From there she watches the rescuer pulls her baby (DC4) to safety and takes it away from the nest. In the background, you can hear Mommy call out to Daddy Eagle. You can hear and see how tired DC4 had become from jerking its leg and crying for almost five hours. Closer to the end, pay attention as DC5 raises his head to inspect what is going on as it is left alone after DC4 is rescued and removed from the nest. It is well after 10pm. The Storm is coming. You can hear thunder and see lightening from a distance. The Rescuer (Matt Morrison) is in the nest. DC4 can tell something is going on. It raises its head during frightening noise made by the sky and the scary noises the humans are making that made its mother fly away. DC4 is rescued. The Rescuer is instructed to push leaves in the V-Shaped area where DC4 got its leg stuck and cover the space pretty good before leaving. Click Here to watch YouTube’s Kevin Quigley video that records the Rescuer’s back to view. Click Here to watch YouTube’s “birdbrain56” video that records the eagles rescue activity with the CAM showing the front of the Rescuer with the front view of DC4’s rescue. I watched this video several times. Amongst the many things I learned about this process, the main take away for me was the fact that this pair of eagles engineered their nest to hold a 170+ pound human. Click Here to watch YouTube’s ‘deeagle55’ video that proves how an event like an eagles rescue can go viral. Deeagle55 shows the eagles rescue live on their Facebook account. Deeagle55 records it and uploads it into their YouTube account for all to see. Awesome! After the eagles rescue, DC5 is left alone. After the eagle rescue, DC5 is left alone in the rain all night after its sibling DC4 was taken to the Maryland Zoo to be examined and treated. Look at how swollen the right foot is; DC4 does not appear to be afraid in this environment. Distracted by a human rescuer, Mom hovers in tree branch above nest and watches his baby (DC4) be put into a bag and taken away leaving DC5 alone in the nest. The parent did not cover the little one who could be seen alone and afraid. In this video, YouTube’s “birdbrain55” After the eagles rescue of its older sibling (DC4), DC5 is left alone in the nest. DC5 is seen walking around inside the nest looking for its sibling and crying out. It is a sad but awesome scene to watch because the little bird seems almost human-like; especially when is lays down in the rain and goes to sleep. “Birdbrain56” uses the infrared camera at 10:20pm to find one of the parents in a tree close by its nest. Normally, when a human ‘invades’ a wild nest, the parent or parents of the animal or bird involved does not return to the nest. In some cases, the baby animal or bird is left to fend for itself leaving survival chances almost nil. All night long in the cold rain storm, DC5 was alone hungry and cold. AEF, turned off the CAMs for two hours after the rescue was made. No one could tell what was going on with DC5. We took to Twitter and Facebook to talk and console each other. Right at 12 o’clock midnight, CAM-A was back on. Those of us that are connected to these birds, fell asleep watching over poor little DC5 as it walked around its nest crying out and as it slept from being tired. Each time I awoke for a bio-break, I checked on DC5. The eaglet was either walking around the nest like a King or asleep like a King. It appeared to get stronger and unafraid as each hour passed. On April 21st, I woke up around 6am the morning after the eagle rescue of DC4. The first thing I did was checked on DC5. I was glad to see that it was still alive in the nest. I remembered, nothing was going to happen to DC5 because it parents were perched over the nest all night. Around 6:30am Mommy Eagle flew into the nest with a fresh fish just for DC5. I am certain that thousands of people like me were happy to see that DC5 was not rejected by its parents and that clearly they had not abandoned their nest. 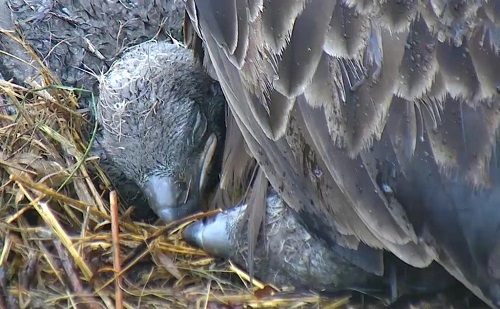 After being left alone all night in the rain, Mom returns to check on DC5 and feeds him. She probably was perched on a branch nearby. YouTube’s “birdbrain56” captures this early morning feeding. Remember, the last time this eaglet was fed was when Mommy Eagle fed both eaglets around 5pm the night before. Usually, the eaglets would have received one more meal between 5pm and 8pm. DC5 did not receive the late-night meal. 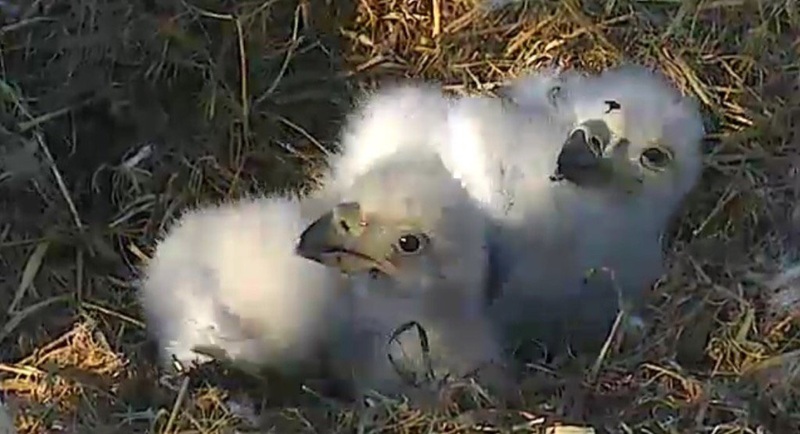 When you watch Mommy Eagle feed DC5 at 6:30am, you will notice how hungry it was. DC5 has never had this much feeding time. Towards the end of this feeding, pay close attention to how the Mommy Eagle inspects area where DC4 got its leg stuck. It is as if she is taking inventory of what is needed to close that area off to prevent her babies from getting stuck in that area again. On the morning of April 21st, YouTube’s “Lil Sunrise” records Mr. P feeding DC5 around 8:30am. 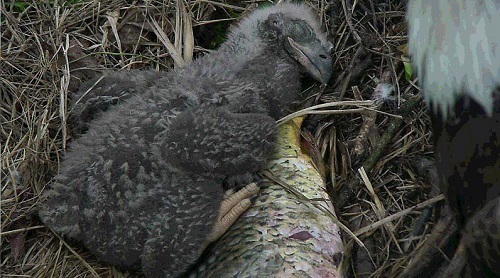 This is the second time DC5 is seen enjoying an entire fish with its parent and not having to wait until it older sibling eats its fill first or be poked in the head and face over first rights to feeding. Today, DC5 eats all it wants with its Parent. Today, DC5 assumes the role of the first born. And Today, DC5 is the aggressor. Today, DC5 is in charge. Eagles Rescued: DC4 is Returned to its nest in the middle of a rain storm. 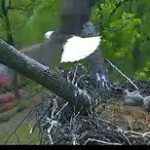 On April 21st, around 5pm, the American Eagle Foundation (AEF) records the heroic return of DC4 to the nest by the same guy that rescued it a day before. The recording of the return of DC4 is uploaded on the AEF’s Facebook Group Page. Pay close attention to DC5 who up to this point has been alone and who have been feed and protected by both its parents. As for as it knows, its older sibling is dead and never coming back. This means that he is the protector of the nest. You can see in the picture above how DC5 stands up to the 170 pound human. Watch the video to see how DC5 reacts when the rescuers climbs back into the next a day later. DC5 is in charge now. On April 21st around 5pm, YouTube’s “Lolaboo two2” recorded the return of DC4 to its nest to be with its sibling DC5 and its parents. This view shows the back of the eagle rescuer to the CAM. In a vicious rain storm, Matt Morrison of Ex-cel Tree Experts performs this heroic act. I believe he is the only human that would have attempted to climb that tall tree to return eagle rescued back to its nest. He is a here. On April 21st YouTube’s “Deeagles55” the best showing of the eagles rescuer’s tree climbing skills as he returns DC4 to its nest. At the end of this video is one of those ‘wait-for-it’ moments, which leaves you wondering did DC4 do that on purpose. On April 21st at 7:30pm, YouTube’s “birdbrain56” records DC4 and DC5 sleeping together. Dad accepts the return of DC4. He flies in with a fresh fish and for the first time since the eagle rescue and return of DC4. For the first time since the eagle rescue happened almost two days ago, the two babies are together again. Daddy Eagle prepares the fish for feeding. Notice the aggression displayed by DC5. Its DC5 that pokes DC4 I the head and its DC5 that is feed first. It is DC5 that eats its full while DC4 is in submission waiting its turn to be fed. Mommy Eagle flies in later. Dad flies away and mom finishes feeding DC4. Note: It is after 10pm. These birds do not eat after dark. Surely this is a special occasion. After the fish is consumed, Mommy Eagle flies away. The two birds are left alone. DC5 pokes DC4 into submission and stands over it with its chest pushed out. My how the tables have turned. This event has been truly awesome and awe inspiring to witness. 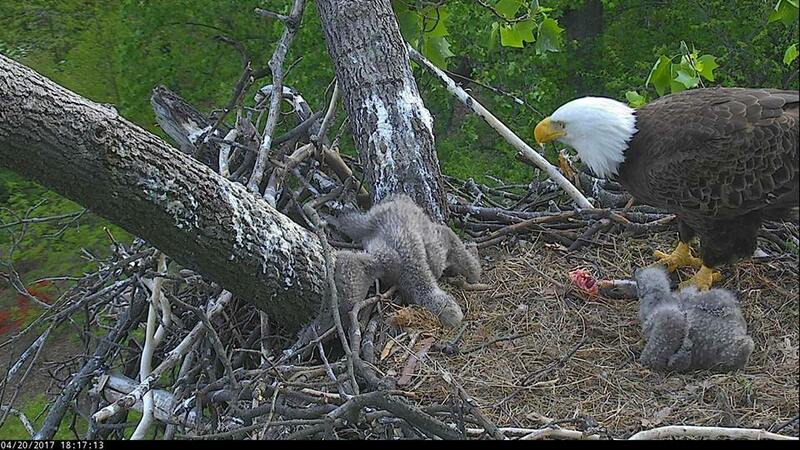 The little eaglet DC5 standing up to a 170lb human to protect its nest. When just a few days ago it was bullied by the sibling that had to be rescued. 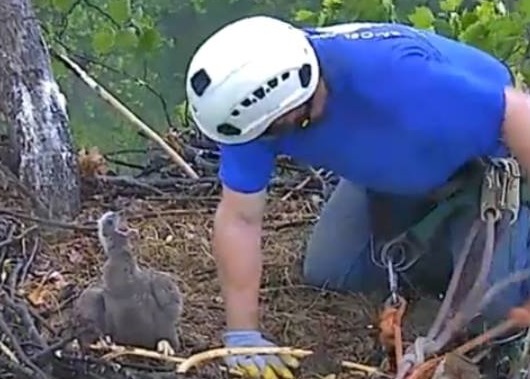 Fascinating to watch this rescue angel climb over 100ft into an Eagle’s Nest in a severe thunderstorm at 5pm. Incredible to watch the injured sibling be happy to return to its nest. And later on, great to watch the DC5 go to DC4 and cuddle in the fetal position to keep each other warm. Wonderful to watch both parents return to the nest to love and feed their babies. I watched as dad tried to place branches and twigs back to protect the wall of the nest. However, I pray that the area where the rescue agent climbed down does not become a dangerous cliff for the babies. I believe mom and dad will start building up that side of the nest soon. Great job everyone and my prayers of gratitude goes out to the rescue agent. I can imagine how excited the little children in his family are to know the kind of hero he was on Earth Day Weekend! 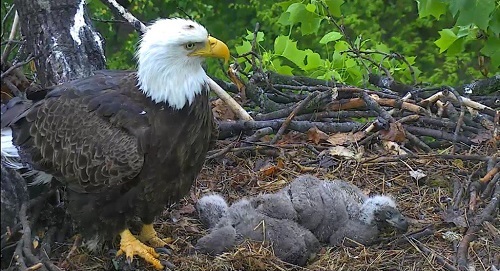 April 22nd – Earth Day – This Eagle Family is back to normal with one exception; DC5 is now the aggressor of the two siblings. On the first full day of the return of DC4, both parents takes precautions to make sure neither eaglet gets trapped in the V-Shaped area of the nest again. On April 22, the day after DC4 was returned to the nest, Mr. P (the daddy eagle), makes sure that neither of his babies would get hurt again, so he works to cover and fix the area where DC4 got its leg stuck. He makes certain that the area is closed off. Helen Connors Bates a member of the Facebook DC EaglesWatchers Club Group records what daddy eagle is seen doing to protect his babies. Without hesitation, he starts working to fix the area that almost killed his baby. I know many humans that would put off what needed to be done immediately to protect his family claiming that they are too tired. This father is truly a provider and a protector. In few days, both parents will start the reinforcement work around the nest because his eaglets will become more playful, adventurous, and yes, more competitive during feedings. The sides of the nest will be put to test when the babies start hopping around and flapping their wings. I hope they start the work soon because there is a big cliff on the opposite side of the area where DC4 got trapped that the eaglets could fall over. This might require human intervention. These babies are going to eat more and get bigger real quick because they will be leaving the nest soon. That area needs serious repairs. YouTube’s “Lil Sunrise” records First Lady bringing a huge fish to the nest for Earth Day Celebration. She feeds both eaglets. DC4 is usually hungry. 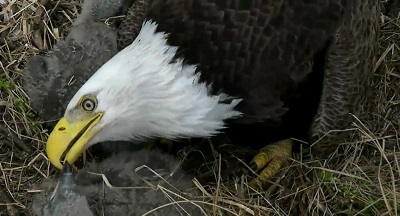 DC4 picks up a old dried and harden fish bone and starts to peck at it for food. Mommy Eagles knows that if the bone gets enlarged in the baby’s throat it could die, so she takes it away from DC4 and places it on the other side of the nest to be discarded. Later, Daddy Eagle flies in with another large fresh fish. Mommy eagle is perched just above the nest steps down to start feeding DC4 and DC5. Mommy had to have asked Daddy Eagle to take the old hard fish bone away because Daddy Eagle immediately picks up the dried fish bone and flies away removing it from the nest. This answers the question about what happens to dried animal parts that are not eaten; they are removed for safety of the eaglets. A Story of True Love. 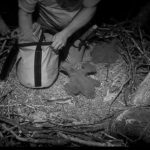 The American Eagle Foundation Captures the three day ordeal in one video; published on April 22, 2017 The American Eagle Foundation, in cooperation with the US Fish and Wildlife Service, arranged for the eaglet to be rescued. Initial examination of the eaglet on the ground by a USFWS eagle expert found that the leg did not appear to be seriously injured. 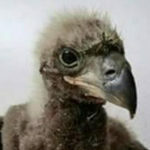 The eaglet was taken to a veterinarian at a zoo in Maryland where a physical check-up a radiograph of the leg confirmed that the eaglet is in acceptable condition with the exception of an abrasion and swelling on the leg. DC 4 was returned to the nest around 5pm on April 21. When the eagles rescue is complete, DC4 is returned to the nest and the Eagle Rescuer is a few steps down the ladder, DC4 turns up its behind and shoots poop that went right down the ladder. I hope none of the poop landed on the Eagle Rescuer. That would not be an appropriate thank you. Check out the American Eagle Facebook Account that documents the eagle rescue and return of DC4. Here you can join in on the discussion and education of the activities and issues related to this emergency event. You may want to join this Facebook Group. 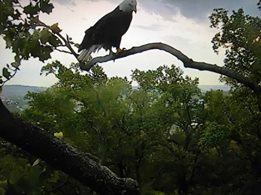 The DC Eagle CAM – CAMs A&B remain on 24hours a day. At anytime of the day of night, you can watch what is going on in the nest live. The Facebook Group Account for the DC EagleCam Watchers Club – This Facebook Group is dedicated to monitoring and watching the 24-hour activities of the DC Eagles in this nest. 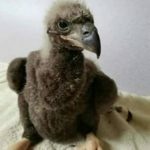 To get familiar with these lovable baby eagles, read and subscribe to my blogs. 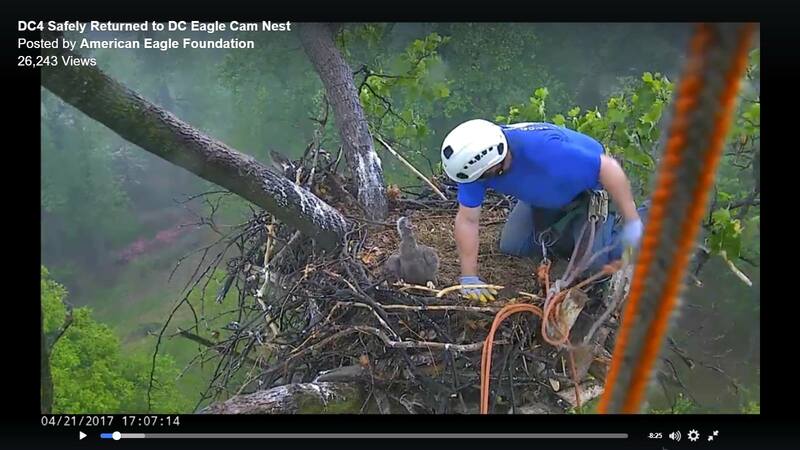 The heroes that monitor the CAMs at the DC Eagle’s Nest in the Arboretum 24-hours a day. Facebook Groups for the DC EagleCam Watchers Club and the American Eagle Foundation. All of the many YouTube video editors. All of the corporate, government sponsors, and scores of volunteers. The team that worked on the eagles rescue project April 20th – 22nd: Craig Koppie of the USFWS, Marty Levine and Matt Morrison (the eagles rescuer of DC4) of the Ex-cel Tree Experts, Sue Greeley of the USNA, Samantha Sander at the Maryland Zoo, and DC5; my little eagle hero. DC5 is my little eagle hero. 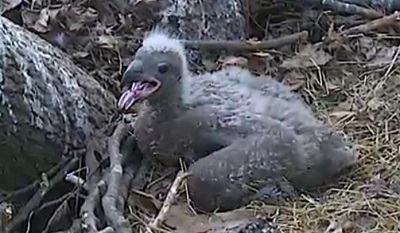 Hatched March30th one day after its sibling, DC5 was often bullied by DC4. On April 20th when the AEF commissioned the eagles rescue of DC4, DC5 was left alone hungry and in the cold rain. DC5 was not abandoned by its parents. DC5 walked the nest w/o its sibling for more than 24hrs. When DC4 was returned to the nest, it was DC5 that stood up to the human – unafraid. It was DC5 that became the aggressor over DC4. DC5 became my hero. A Naming Contest was sponsored by the American Eagle Foundation (AEF), which ended April 17th. The AEF formed a panel of judges that reviewed all names that were submitted and have agreed to the Top Four Unisex Names for DC4 and DC5. Click Here to read my Blog to Vote for one of the Top Four Unisex Names that you think best fit DC4 and DC5 -2017. After the names are selected, we will no longer refer to them as DC4 and DC5.